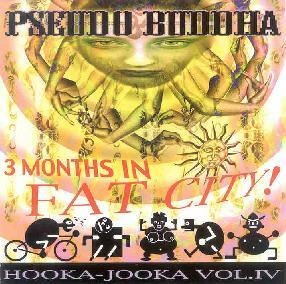 Pseudo Buddha - "3 Months In Fat City! Hooka-Jooka Vol. IV"
I had heard Pseudo Buddha’s music compared to Ozric Tentacles, so I was kind of expecting that festie vibe when I put this CD on for my first taste of the band. Since I haven’t heard their other albums, I can’t comment on them, but I hear only a little Ozric’s influence on 3 Months in Fat City. Yes, this is ethnically flavored instrumental jam music, but that’s basically where the comparison leaves off. Pseudo Buddha go for a slower, denser, and definitely darker sound to their music. Deep drones, exotic percussion, and other world instruments give it far more of a true ethnic flavor than a festie feel, but that’s only where it begins. Sax and clarinet lend the music a definite jazzy feel, whereas the various devices and effects bring in deep levels of spaciness as well. As Vol. IV of the Hooka-Jooka series, all four tracks are improvisations recorded live in late 2002. Consequently, these are not studio perfect recordings. They have rawness and a stimulating energy to them that is quite exhilarating, even in the quieter moments. September 6 gets things going with one of the spacier tracks on the album, a slow, trancey meditation, with twittering flutes and tapping percussion that evolves into an amazing dronefest, with deliciously brooding, deep, deep guitar licks. October 4 picks up the pace, the percussion coming in more rapid fire, as the drones beneath become deep and swirling, and the lead takes on a distinctly Middle Eastern feel. This is followed by the showpiece of the album, the epic and astonishing November 1, which shifts back and forth between dreamy, dark jazzy passages and freaked out rock jams for a 32-minute voyage into delirium and ecstasy. Things glide into space once again for the closing track, November 14, a sonic spacescape that ebbs and swells like gigantic cosmic waves, a fine floating, dark and dreamy ending to the album. All in all, 3 Months in Fat City is a truly electrifying listening experience. It had me totally grooving to its dark intensity and hypnotic rhythms while at the same time tripping out to its exotic and spacey atmospheres. Had I had a chance to listen to this a little more before I put together my list, this would have likely made my Top 10 CD’s of the year. The band’s web site is listed as http://www.pseudobuddha.com, but there’s nothing there, so perhaps they’re still working on it. Never the less, you can find out more about them and how to order their CD’s from http://www.dogfingers.com.